Geoduck clams have been estimated to be up 147 years old. The Pacific geoduck clam Panopea generosa is one of the largest burrowing clams in the world. The shell has been measured to be up to 212 mm with a wet weight of 3.25 kg. Geoducks can bury themselves so that their siphons stretch 1 meter to the substrate surface. The outside and inside of its shell are white and the shell is rounded anteriorly, truncated at the siphon end, gaping at all sides due to a large body and neck. 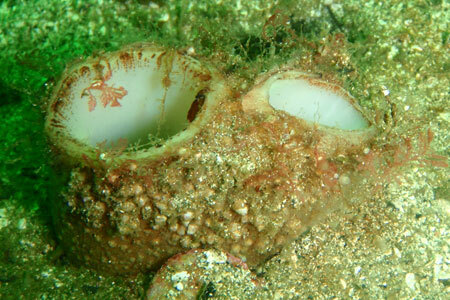 Small juveniles have a large, well-developed foot, which becomes proportionally smaller as the clam grows. A troubling problem is the tendency for geoduck clams to bioaccumulate undesirable microorganisms or compounds. In particular, high levels of paralytic shellfish poisoning (PSP) have been found in geoducks in Southeast Alaska, most strongly associated with the viscera. The mantle and necks are the usual body parts consumed and PSP concentrations are lower in these parts. Though this situation permits the sale of processed clams with viscera removed, exvessel value for processed clams is significantly less than that for whole, live product. The geoduck clam passes through seven life-history stages. Growth is rapid during the first years of life and then nearly ceases. Growth rate is extremely variable throughout a geoducks life. In fast growing areas, they can grow up to 30 mm per year for the first 3-4 years of their life. The sexes of geoducks are separate. Geoducks studied in British Columbia found the gonads of geoducks to be ripe in April and May and for reproduction to occur in June and July, with males having a more protracted spawning event than females. Geoducks have been found to be sexually mature after 3 years and still producing gametes up to 107 years old. Males mature at a smaller size and earlier age than females. Females have huge ovaries that contain many millions of eggs but they are dribble spawners only releasing one to two million eggs in a single spawning event. Fertilization occurs in the water column. Besides the reproductive output of these large clams, recruitment is low and juveniles are scarce. Fertilized eggs are suspended in the water column and then become larvae after between 16 and 47 days. Then the larvae transform into a dissochonch which changing from a planktonic existence to a sedentary one on the seabed surface. They can then use their ciliated foot to crawl along the surface of the sea bed and eventually they use their foot to burrow down in the sand. Geoducks feed on phytoplankton some of which is transported to deeper depths by wind-driven or tidal currents. Geoducks occur from Newport Bay, California to Kodiak Island, Alaska. In the central and southern portions of Southeast Alaska, geoduck clam beds have a patchy habitat specific, primarily in protected waters near the outside coast. Highest densities are found in fine to course sand substrates with minimal surge energy. 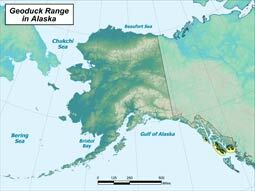 Southeast Alaska is the extreme northern limit of the geographic range. Highest densities of geoducks within Southeast, Alaska have been observed in the large island groups just west of Craig, including shoreline adjacent to Suemez Island, Baker Island, Lulu Island, and Noyes Island. Geoducks live buried up to 1.3 meters below the surface of the sediment, occur from the zero tide line down to 100 meters, and remain in the general substrate area of settlement following metamorphosis from veliger to juvenile stage. In many areas of Southeast Alaska, sea otters are depleting populations of geoduck clams, sea urchins and sea cucumbers. There has been a significant decrease of abundance in these species in some of the areas of the outer coast where sea otter populations have exploded and expanded.